There has been a trend that has defined contemporary British piano trios over the last decade or so; one which has seen harmony and melodic development put on the back burner in favour of exploring, in real depth, the intricacies and nuances of rhythm and metre. Phronesis, the UK-based jazz trio comprised of pianist Ivo Neame, bassist Jasper Høiby and drummer Anton Eger, were early pioneers of this trend. While subsequent trios have doubled down hard on that basic tenet of “rhythm first”, Phronesis have spent the last decade using the idea as the basis for them exploring a vast multitude of musical principles and ideas. Having tackled adapting their sound for big band on their 2017 album, The Behemoth, and touring a new composition called Decade Zero for jazz trio and orchestra, Neame, Høiby and Eger have returned with their first album of original material since 2016’s Parallax. 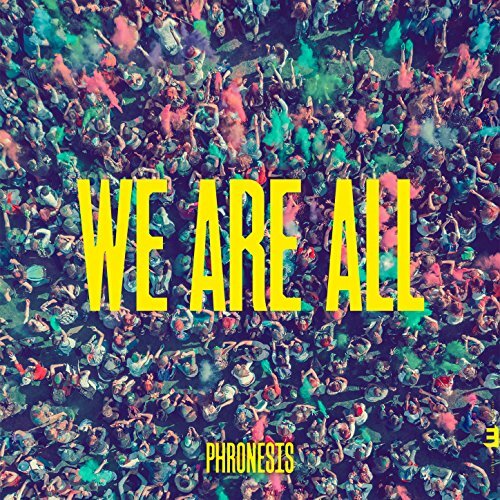 The record is called We Are All and it would appear that the band’s experience playing with larger ensembles has inspired their approach to their latest batch of trio compositions. We Are All feels like an attempt to make the trio sound like a much larger ensemble without any fancy editing or overdubbing. There’s something breathtakingly symphonic about these pieces – the composed sections are arranged in such a manner that creates the illusion of there being far more than three instruments in the room, and the solos are dramatic and expansive, with enough character to feel like they advance the musical narrative of each track. The record opens with ‘One for Us’, the longest track on the album, and the one which takes the most obvious stylistic cues from Romantic-era orchestral music. The track begins with a spacious, resonant piano introduction from Neame, upon which he builds the gorgeous, sweeping arpeggios which contribute to many of We Are All’s expansive arrangements. Høiby then enters with a powerful bowed bass line, doubling the main melodic hook established by Neame, all of which builds to the brilliantly theatrical entrance of Eger with a massive cymbal crash, reminiscent of the massive percussion sections of Tchaikovsky and Mahler’s larger symphonic works. ‘The Edge’ was another highlight, with Høiby and Neame alternating between the higher and lower registers of their instruments, creating the illusion of call and response between two sections of an orchestra, made even more noticeable by Høiby’s frequent switching between bowed and plucked bass playing. As one would expect in a trio with these three instruments, the piano carries most of the harmonic weight. This is, however, a Phronesis album, so each instrument brings its own character to the record, frequently putting Høiby’s thunderous bass runs in the forefront. The bassist also provides the main thematic content for a few of the tracks, such as ‘Breathless’; a piece built from a simple, yet provocative descending bass motif, over which Neame and Høiby demonstrate their dexterity with inventive soloing. The main melody is built slowly throughout the piece, only emerging in full at the very end. ‘The Tree Did Not Die’ does something unexpected for a Phronesis tune – it introduces a synthesiser to the trio’s well-established, acoustic sound. In response to this addition the band’s entire aesthetic shifts. Neame’s synth part is ethereal and strange (perhaps influenced by the electronics-heavy sound of his recent solo album, Moksha), and rather than following suit, Høiby and Eger’s playing reacts by becoming more rigid. The bass line follows a meticulously complex rhythm played largely on a single note, whilst Eger’s drumming is varied, yet hauntingly robotic (not dissimilar to that of Radiohead’s Philip Selway). At the track’s midpoint, however, all of this shifts. Everything becomes more cyclic and sustained, before beginning to move through a number of texturally varied vignettes (one particularly brilliant one sees Høiby aggressively plucking out chords on his double bass). The piece’s structure is almost programmatic, with each segment conjuring up different images and landscapes. Despite the band having scaled back, instrumentally, for We Are All, the album is, by quite a long shot, Phronesis’ most ambitious in its 13-year run. The trio’s arrangements have always been intricate, but never before have they utilised them so effectively to push their particular sub-genre of jazz forward. We Are All is powerful because it works so hard to sound bigger than it is, which allows for each piece to develop musical ideas on a much grander, more dramatic scale. The whole endeavour is utterly stunning. We Are All is out now on Edition Records. You can listen to and purchase it here.